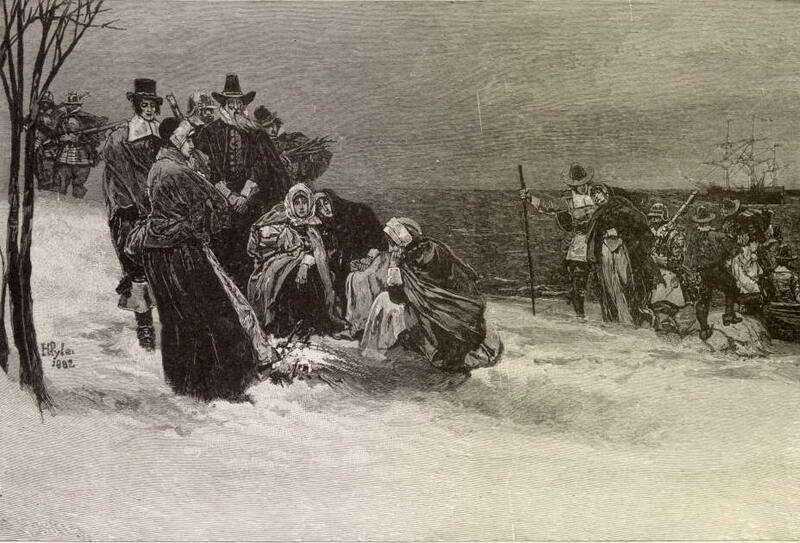 “The Landing of the Pilgrims” by Howard Pyle from “Harpers Weekly” 1882. Pyle, contrary to the other more fanciful depictions of his time, compellingly depicts what must have been a desperate landing. December 22, 1996. 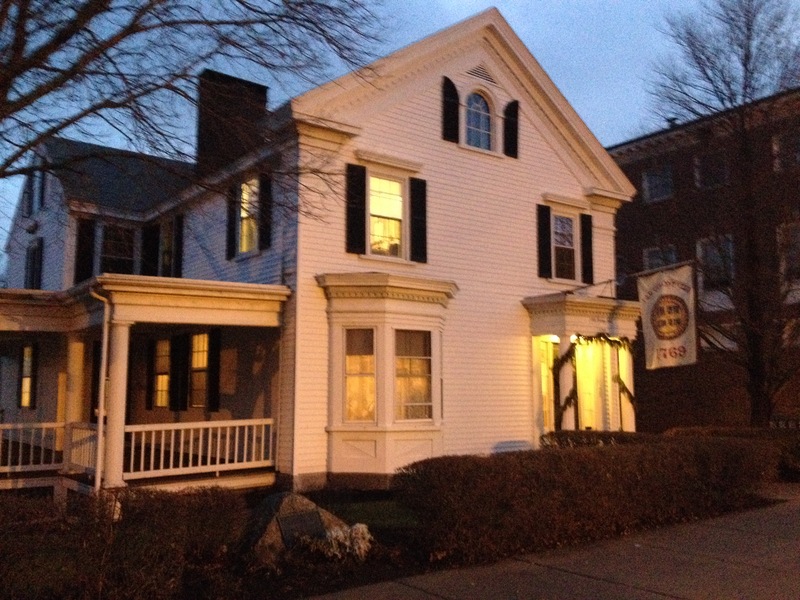 I had, just a few months prior, moved to Plymouth and was living in a downtown apartment on historic North Street. At about 6 a.m. that morning, I was sound asleep, not then being the early riser that I am now. I was woken suddenly at that dark hour (dawn still being about an hour off) by the improbable sound of a small marching band blaring away. It sounded for all the world as though every player were in my room. For a brief moment, I thought I was having some sort of strange hallucination. Then, waking up a bit more, I realized the sound was out on the street. Like the old story goes, I sprang from my bed and threw open the window sash. It was very cold, I remember that. Sticking my head out the window, I saw the band march by, illuminated by the street lamps. They were followed by a long procession of men in dark coats and black tall hats marching two by two. What on earth was this? Apparently, I was not the only newcomer on the street confused by the noise. I remember hearing a good deal of hollering from other houses. Perhaps a few choice four-letter words. I could see the men in the procession smiling. Then I made the connection. The Landing of the Pilgrims. Forefathers Day. I knew the date, but had no idea at the time that it was observed in this fashion in Plymouth. The procession moved past. It was one of the strangest things I’d seen–a parade in the dark, in the midst of winter. I laughed and went back to bed. I might have been close to getting back to sleep when suddenly…BOOM! The report of a cannon shook the room. And that was eventually followed by two more. A three-round salute to the Forefathers fired from Cole’s Hill, literally a stone’s throw from my apartment. Needless to say, by that time I was quite awake. The members of the Old Colony Club, the men in the tall hats, have been marking Forefathers Day with a pre-dawn cannon salute for long, long time. The first such observance took place the year the club was founded in 1769. Seven young gentlemen established the club in order to create a social environment which would avoid, “the many disadvantages and inconveniences that arise from intermixing with the company at the taverns.” Before the year was out, the members voted to organize a grand commemoration to be held on December 22, 1769 honoring the anniversary of the landing of their ancestors in Plymouth. On the morning of that day a cannon was fired. There was a mid day dinner featuring dishes that would have been known to the Pilgrims–succotash, oysters, clams, cod, venison, among other courses. After the dinner, at 4 p.m., there was a procession in which many descendants of the first settlers participated. Songs, a salute with muskets, and three cheers. At sunset, another cannon salute. Then followed an evening meeting during which the president of the club officiated while seated in the chair that had belonged to Governor William Bradford (now at Pilgrim Hall Museum). After toasts and much conversation, the meeting concluded at 11 p.m., a third cannon was fired, three cheers were again given, and the club and the company went home. The Old Colony Club continued to organize Forefathers Day observances until 1774 when a rift formed between the Loyalist and Whig members and the club disbanded. For many years thereafter, Forefathers Day addresses were organized by the town government, with some gaps, most notably from 1780 to 1794 when no celebration occurred. In 1820, a new group was formed which took over the annual commemoration of the landing of the Pilgrims. The Pilgrim Society, which now operates Pilgrim Hall Museum, has ever since organized a Forefathers Day observance. Their first, in 1820, featured a rising star, a former Congressman (and eventually U.S. Senator from Massachusetts) Daniel Webster. His address was attended by an immense crowd. In addition to praising at length the courage and perseverance of the Forefathers, he took the opportunity to condemn the international slave trade. Antislavery would be a recurring theme in Forefathers Day addresses prior to the Civil War. I am just returned from Plymouth where the Old Colony Anti-Slavery Society held its usual celebration of Forefathers’ Day…The Abolitionists, with that meddlesomeness which is the badge of all their tribe, picked [Forefathers Day] up and perverted it from its proper ends to their own base ones. Instead of making it a good, comfortable occasion of magnifying the Fathers…they have, for several years, used it as an opportunity of venting their spleen against our most cherished institutions. The Old Colony Club was re-established in 1875 and promptly began organizing Forefathers Day celebrations more akin to the original in 1769 (although not quite so lengthy). The Pilgrim Society continued to hold their annual oration and dinner, although by that time it had been realized that the Old Colony Club, back in 1769, had miscalculated in converting dates from the old Julian calendar used in Pilgrim times to the newer Gregorian calendar. Thus the Pilgrim Society marks the landing of the Pilgrims on December 21 while the Old Colony Club sticks to their original date of December 22. This all caused much consternation during the 19th century. But it matters little at this point. The observances, regardless of exact date, are what is important. This morning, December 22, 2014, at about 6 a.m., I found myself marching down North Street with the rest of the Old Colony Club, a black tall hat on my head, listening to the band playing ahead of me. We reached Cole’s Hill overlooking Plymouth Rock, the proclamation was read, three cheers were given and the cannon fired three times. At the start of the march, I had intended to look up at the window that I had stuck my head out of some 18 years ago. But, being a bit caught up in the moment, I passed the old house right by without a glance.